ACT Test Prep For Dummies gets you ready for one of the biggest tests of your high school years. And, the more practice you have, the better you’ll score. Featuring more than 950 practice questions covering critical English, Reading, Science, and Math skills. The full version includes: • 950+ practice questions from each category you’ll see on test day • Full-length, practice tests give you a feel for what to expect on the test • An extensive list of tips designed to make your test day as successful as possible: · Advice on managing your time wisely · Tips to make smart guesses · Spotting test traps · An overview of ACT Scoring · A preview of the ACT and What to Expect on Test Day · How to Write a High-Scoring Essay · Deciding Whether to Repeat the ACT Our proven tips are designed to make test preparation and test day just a bit easier. 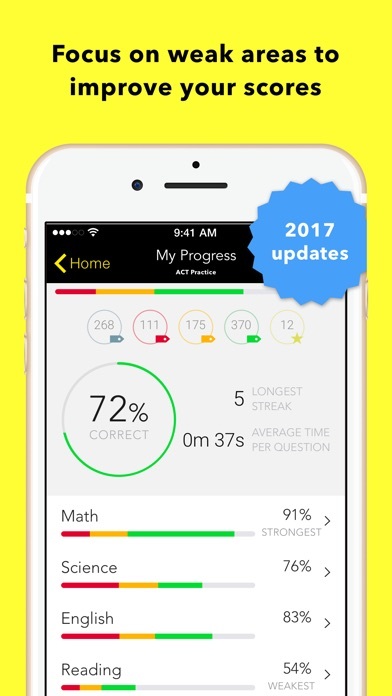 Regardless of your academic strengths or weaknesses, the ACT Test Prep For Dummies App gets you test-ready. Definetly would recommend this app. It include awesome tips. Worth every penny! This app is great for helping prepare for the ACT! Lots of tips for every type of problem & scenario. Highly recommend!!! The app includes everything it shows for the app and is an excellent tool for act prep. I'm a seventeen year old about to take the ACT, and I just got this app. It's very helpful with studying for the ACT already. I've learned multiple tips for taking the ACT and it's only been about twenty minutes. It had excellent information. It has everything you need to prepare for the ACT. The only flaw I found was that majority of the math that was used for examples and questions were completely wrong. Whoever made this definately needs to learn math again. Other than that, it had everything needed to do good.